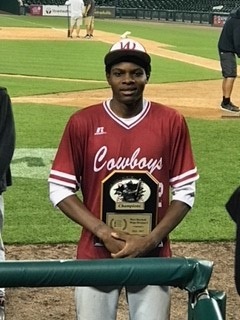 DETROIT – June 5, 2018 – Western International High School senior and baseball player, William English, age 17, was selected in the fifth round of the 2018 Major League Baseball (MLB) draft by the Los Angeles Angels. English, a 6-foot-4 right-handed pitcher and outfielder, is one of the youngest players in this year’s draft class and began playing baseball at the age of three. With a 90-93 mile per hour (mph) fastball, English was named the No. 1 top MLB draft prospect in Michigan. This past year, English was heavily scouted by numerous teams including the Texas Rangers, Cleveland Indians, Atlanta Braves, Minnesota Twins, New York Yankees and St. Louis Cardinals before being selected by the Angels. Principal Garcia and Coach Sanchez also commended the student-athlete on his preparation and accomplishments that led to being drafted. This past November, English was offered a scholarship and signed with the University of Tennessee after receiving offers from North Carolina A&T, Central Michigan University, Michigan State University, Bethune College and four junior colleges. Although he will soon be traveling to California to follow his dream, he contends that he will eventually go to college and complete a degree in business. English has received All-City honors for four years and was most recently named a nominee for Mr. Baseball, Athlete of the Year, Double Duty Classic, East Coast Pro and 2018 MHSB All Star. “I promised my mom I’d go back to school no matter what, and a promise is a promise,” he said. This entry was posted in Info News Center, News and Press Releases, Sports and tagged 584.